Discussion in 'News in Nigeria' started by djayz1, Oct 9, 2016. Earlier today, Operatives of the Department of State Services (DSS) and the police made an attempt to arrest a Federal High Court judge in Port Harcourt, Rivers state. 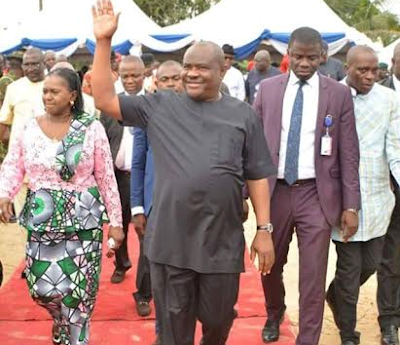 The state governor, Nyesom Wike, rushed to the scene and was harassed by the operatives when he prevented the arrest. In a statement released this afternoon, the DSS stated that they have indeed embarked on series of special sting operations involving some Judges of the Supreme, Appeal and High Courts, but were resisted in Rivers state. "In one of the States where the Service operations were conducted, credible intelligence revealed that the Judge had Two Million United States Dollars ($2,000,000 USD) stashed in his house. When he was approached for due search to be conducted, he in concert with the State Governor, mobilized thugs against the Service team. The team restrained itself in the face of unbridled provocative activities by those brought in by the Governor. Unfortunately, the Judge and Governor also engaged the tacit support of a sister security agency. The Service surveillance team noticed that upon frustrating the operation, the Judge with the active support of the Governor craftily moved the money to an unknown location which the Service is currently making effort to unravel." "This is the time to say no to illegality. If they are testing the waters for rigging and mayhem, it will not work. I told the security operatives who planned to abduct the judge that instead of this impunity, you better take my life. I will always protect the interest of this state. When God gives you an assignment, he will give you the enablement to complete the assignment. Rivers people must be ready to fight any form of injustice. I am ready to defend Rivers State with my life".